Though the sun lies 93 million miles (149 million kilometers) from Earth, its unceasing activity assures an impact on our planet far beyond the obvious light and heat. From a constant stream of particles in the form of solar wind to the unpredictable bombardment from solar flares and coronal mass ejections, Earth often feels the effects of its stellar companions. Less noticeable are the sunspots crossing the solar surface, though they are related to the more violent interactions. All of these fall under the definition of "space weather." Studying the surface of the sun can reveal small, dark areas that vary in number and location. These sunspots, which tend to cluster in bands above and below the equator, result from the interaction of the sun's surface plasma with its magnetic field. According to NASA, sunspots are "the most visible advertisement of the solar magnetic field." 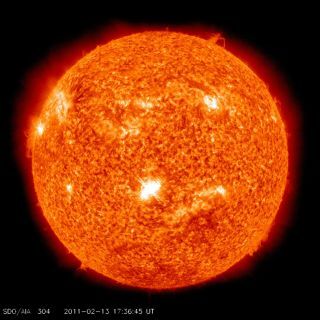 At temperatures of 3,800 kelvin (6,380 degrees Fahrenheit or 3,527 degrees Celsius), sunspot temperatures are nearly 2,000 K (3,140 F / 1,727 C) less than the rest of the sun. But don't let the numbers fool you. If a single sunspot stood alone in the night sky, it would be 10 times brighter than the full moon. Similarly, sunspots might seem small when compared to the 865,000-mile (1.392 million km) diameter of the sun, because they typically cover less than 4 percent of its visible disk. However, ranging from 1,500 miles to 30,000 miles (2,500-50,000 km) in size, they can reach the width of the planet Neptune, the smallest of the gas planets. But with a lifetime of anywhere from a few days to a few weeks, sunspots are far less permanent. According to NASA, it takes approximately 11 years for the sun to move through the solar cycle that is defined by an increasing and then decreasing number of sunspots. As it reaches the close of a cycle, new sunspots appear near the equator, while a new cycle produces sunspots in higher latitudes. The cycles overlap; sunspots from the previous cycle can still develop even after sunspots from the new cycle appear. So solar scientists have a very difficult time saying exactly when one cycle ends and the next begins. As of early 2017, solar cycle 24 was approaching solar minimum. The 11-year cycle began in January 2008 and peaked in 2013, the weakest solar maximum in 100 years, according to NASA. Despite the low level of activity, one of the largest sunspot regions ever was observed in November 2014, reaching approximately the size of Jupiter. Temperatures in the outer layer of the sun, known as the corona, typically fall around a few million kelvin. As solar flares push through the corona, they heat its gas to anywhere from 10 to 20 million K, occasionally reaching as high as 100 million K. According to NASA, the energy released in a solar flare "is the equivalent of millions of 100-megaton hydrogen bombs exploding at the same time." Because solar flares form in the same active regions as sunspots, they are connected to these smaller, less violent events. Flares tend to follow the same 11-year cycle. At the peak of the cycle, several flares may occur each day, with an average lifetime of only 10 minutes. The enormous sunspot of 2014 fired off several powerful solar flares. When the energized particles exploding from solar flares race toward us, they arrive in only eight minutes. Astronauts in space risk being hit by these hazardous particles, and manned missions to the moon or Mars must take this danger into account. Everyone else is shielded by the Earth's atmosphere and magnetic field. Sensitive electronic equipment in space can also be damaged by these energetic particles. Sometimes, it's not activity but a lack of it that can release deadly particles toward Earth. The interactions of hot plasma of the corona with the sun's magnetic field can create coronal holes, which permit plasma to stream rapidly from the sun. "The effects linked to coronal holes are generally milder than those of coronal mass ejections, but, when the outflow of solar particles is intense, can pose risk to satellites in orbit," NASA said in a statement. In 2017, scientists were able to link high-energy gamma ray bursts to solar flares for the first time using NASA's Fermi Gamma-ray Space Telescope and its Solar Terrestrial Relations Observatory (STEREO). "These particles must travel some 300,000 miles [500,000 km] within about 5 minutes of the eruption to produce this light," study co-author Nicola Omodei, a researcher at Stanford University in California, said in a statement. It takes several hours for the CME to detach itself from the sun, but once it does, it races away at speeds of up to 11 million km/h (nearly 7 million mph). One of the fastest recorded CMEs, registered in 2012, traveled about 6.48 million to 7.92 million mph (10.43 million to 12.75 million km/h). "Seeing a CME this fast, really is so unusual," Rebekah Evans, a space scientist at Goddard's Space Weather Lab, said in a statement. "And now we have this great chance to study this powerful space weather, to better understand what causes these great explosions, and to improve our models to incorporate what happens during events as rare as these." The cloud of hot plasma and charged particles may be up to 100 billion kilograms (220 billion lbs.) in size. If the CME is aimed in our direction it takes the particles take anywhere from one to five days to travel the distance to our planet. The solar wind, a constant stream of charged particles ejected by the sun, acts on the cloud like a current on a boat. Faster CMEs feel the drag of the wind and slow down, while those with low initial velocities speed up. Auroras (Northern Lights): When the energy from a solar storm reaches the vicinity of Earth, charged particles in our planet's upper atmosphere interact with air molecules to create auroras. These Northern Lights, as they are also called, can be fantastic displays of color. The solar wind also generates a near-constant but less spectacular display. Many solar storms aren't aimed toward us. At the high point of the solar cycle, the sun may produce as many as five CMEs in a given day; even at the low point, it averages one a day. The spherical shape of the sun means that most of them miss the Earth completely. In fact, we can't even observe all of the ejections; those emerging directly opposite our planet are undetectable. However, when the sun does eject a cloud of plasma and gas directly toward us, the incoming matter seems to surround the sun. Much like a baseball falling from the direction of the sun can seem to grow larger and dwarf the star, the so-called "halo coronal mass ejection" can appear to overshadow its source. Such ejections cause the most problems for the people on Earth. When the particles reach the Earth's magnetic sphere, they stretch and distort. Much like a tree in a strong wind, the day side — the first side affected — is compressed, while the night side is stretched out like a tail. When it reconnects on the night side, it releases the energy found in a bolt of lightning. While lightning lasts on the order of microseconds, however, the magnetic storm created lasts far longer. It races back toward Earth's upper atmosphere. On Sept. 1, 1859, Richard Carrington and Richard Hodgson, both amateur English astronomers, independently made the first observations of a solar flare, one that resulted in the largest geomagnetic storm ever recorded. Auroras, which normally occupy the polar regions, were visible in tropical latitudes. Telegraph operators reported being shocked — literally — by their instruments. Even after unhooking them from the power supply, messages could still be transmitted, powered by the currents in the atmosphere. The so-called Carrington Event would be far more devastating if it happened today, given the greater reliance on electronics and the expanded power supply. However, thus far, it is the strongest storm yet recorded, though scientists think that a powerful CME from 2012 that missed Earth would have wrecked havoc for several years had it collided with the planet. Similarly, several satellites keep the entire sun under constant observation. NASA's Solar & Heliospheric Observatory (SOHO) spacecraft studies the sun, while the Solar Dynamic Observatory (SDO) focuses on solar atmosphere. Advanced Composition Explorer (ACE) samples particles from the sun as they stream toward our planet. In November 2016, the National Oceanic and Atmospheric Administration launched the latest of its Geostationary Operational Environmental Satellites, GOES-16. Since 1975, the GOES satellites have monitored Earth's atmosphere along with solar activity. These programs will help bring a greater understanding of the subject of space weather on Earth. In 2015, the United States announced its plan to deal with space weather. The National Space Weather Strategy outlines a framework to better understand, predict, and recover from space weather-related events, while the National Space Weather Action Plan specifies activities to reach these broad goals. "The efforts undertaken to achieve the objectives of this strategy will establish a national approach to the security and resilience in the face of our improved understanding of the seriousness of the space-weather risk, and the steps we must take to prepare for it," Suzanne Spaulding, undersecretary for the U.S. Department of Homeland Security's National Protection and Programs Directorate, said during an event hosted by the White House Office of Science and Technology Policy (OSTP). Editor's Note: This article was updated on Nov. 5, 2018 to reflect a correction. The original article stated that CME particles take eight minutes to reach Earth.